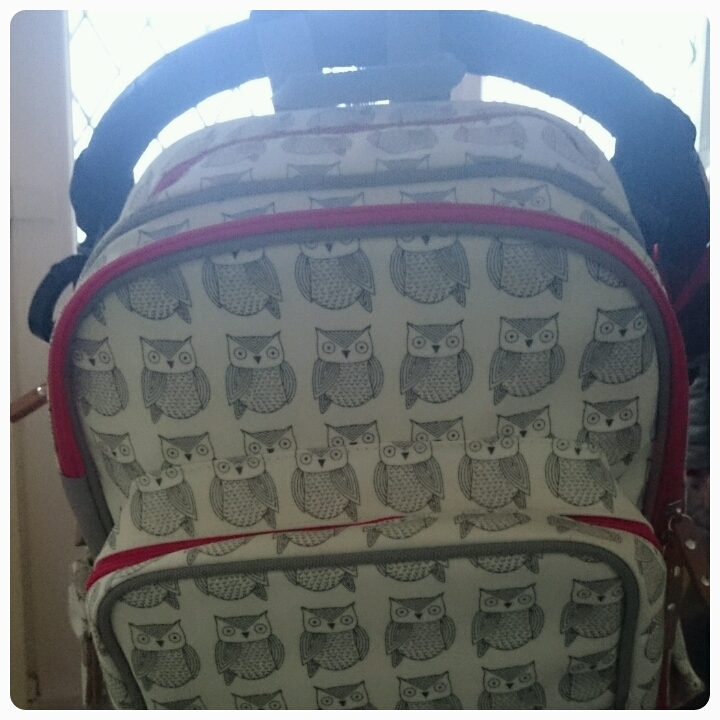 Changing bags, every parent needs one but with so many on the market these days it's hard to decide on one suitable. 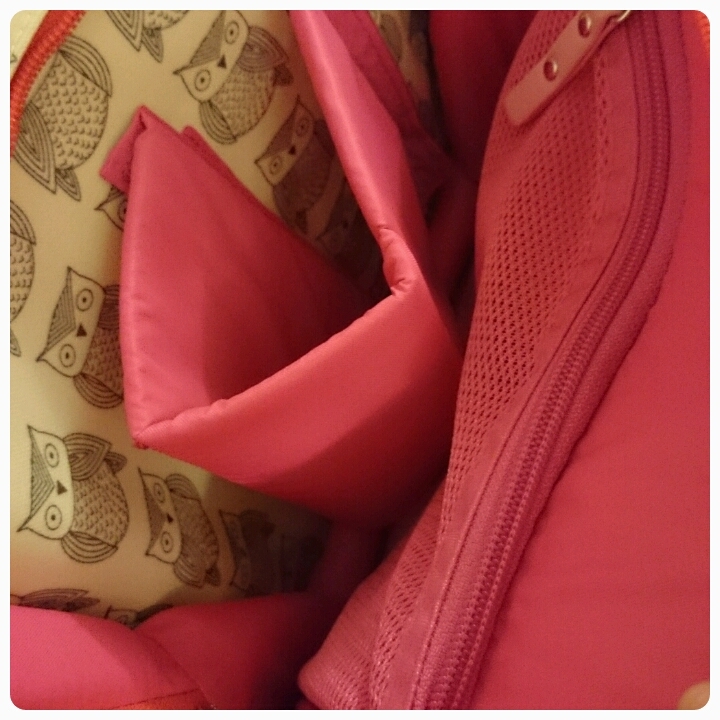 I had the pleasure last year of reviewing the Pink Lining Yummy Mummy bag and I had nothing but good words to say about it, so when I was given the oppurtunity to review their Wanderlust bag recently I was expecting good things, I just didn't know how good…. With Layla getting older and using the pushchair less and less, I don't have the need for a typical changing bag anymore. I no longer have the option to hang it over the buggy handles and carrying a big bag becomes awkward especially when Layla wants carrying too. The Wanderlust changing bag is slightly different to the norm because it is styled more like a rucksack. Designed to be worn over your shoulders, it leaves you with your hands free for other things, this was a positive for me straight away. It seems like the perfect alternative when you are stuck between not needing a changing bag but not having enough room in your handbag. Lets start with the design. 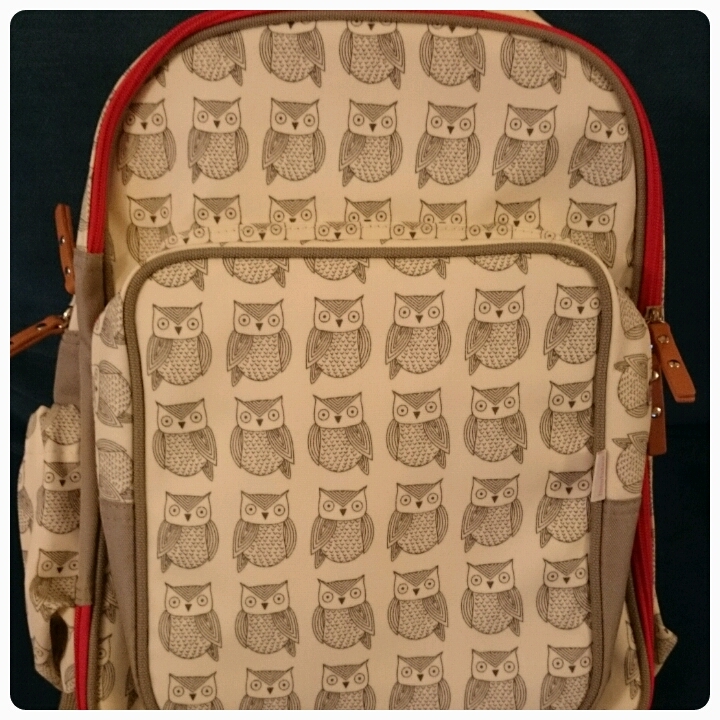 I adore the print, the owls are stunning but I think they remain neutral which makes this bag more suitable for both mums and dads. The red piping detail seems to make the print stand out more and the leather zip pulls seem like an added luxury. The wipe clean material and water resistant bright pink inner just complete the look effortlessly. It is deceiving just how spacious the bag is until you open it up. There are three compartments which hold numerous pockets. 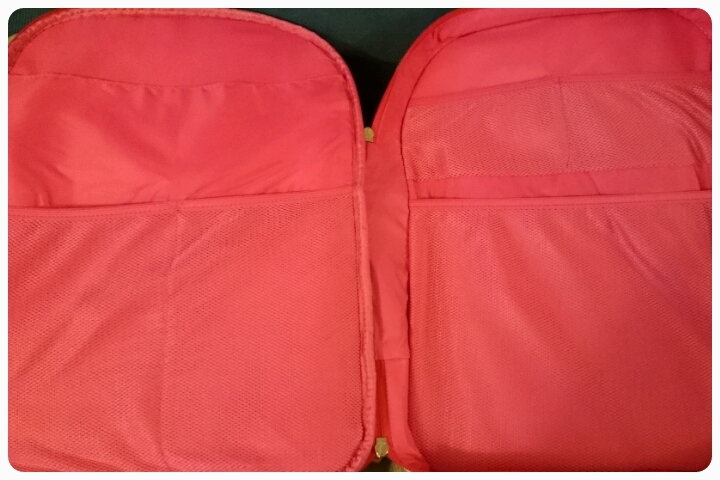 The front section is insulated, perfect for the kids snacks and drinks or little ones bottles and the middle section even opens up completely flat, I could see that feature being handy for a changing a newborn baby. There is literally a space for everything except the kitchen sink. 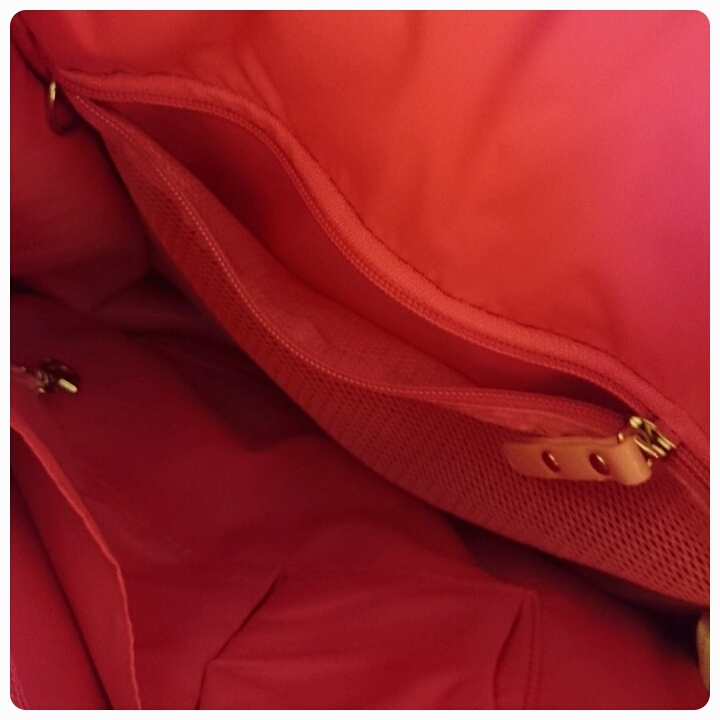 With two zips on each section, the rucksack is simple to open and close but with so many zipped pockets inside, you know all your belongings are safe at all times. 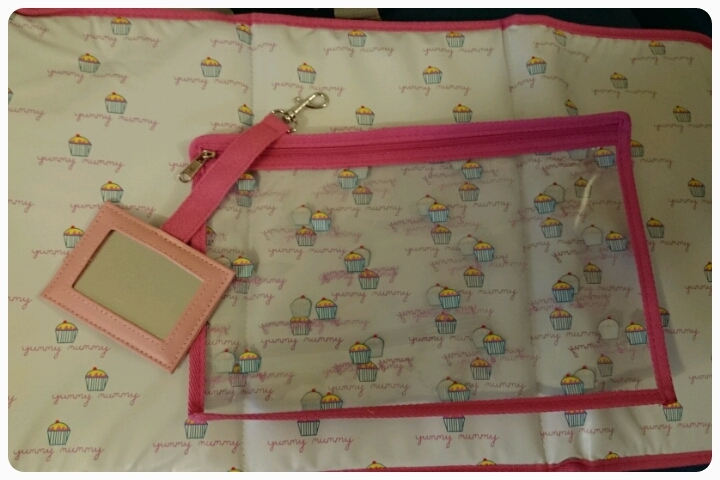 Coming complete with many accessories including Pink Lining's signature cupcake changing mat and wet bag, you will be well prepared. 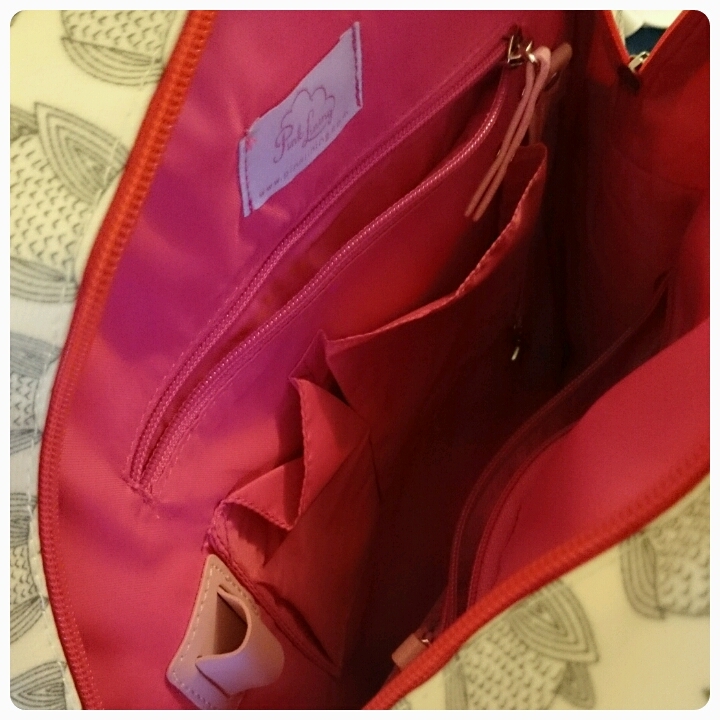 Finding things in your bag will no longer be a problem, with slots for pens, phones and a chain to hold your keys on, gone will be the panic rummaging around to find your purse or keys which have slid to the underneath of your bottomless pit, I mean bag. There is even a mirror for that all important hair and make up check, scrap that I don't get the chance to do my hair or put my face on ;) The mirror actually comes in handy to give to your little ones to provide themselves with a little entertainment. Carrying the bag is a joy, the padded shoulder straps are extremely conforatable and even when the bag is filled, it doesn't feel heavy at all. However there is a handle at the top of the bag which also gives you the option to pop it over one arm if your shoulders did need a break. 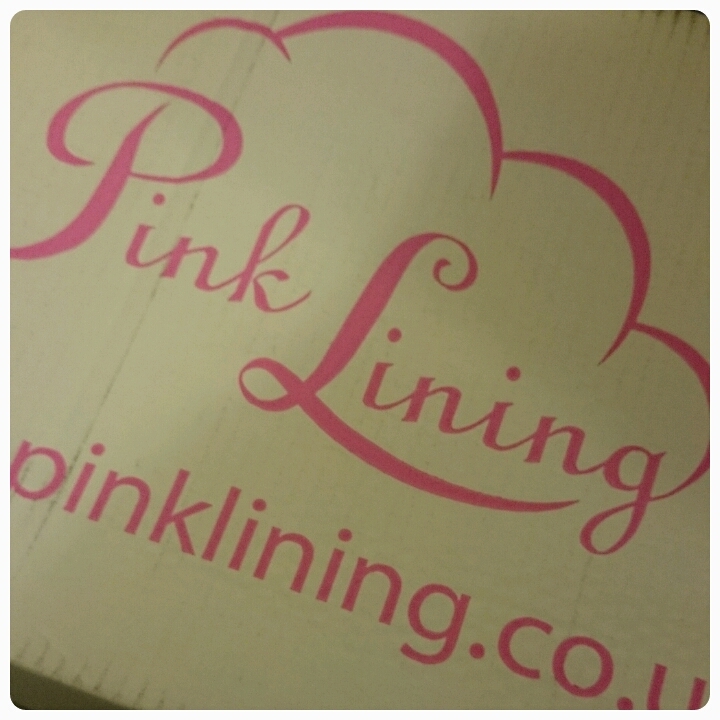 As usual Pink Lining have thought of everything. I do still use the pushchair on occasion and using the Wanderlust rucksack was still possible because there are buckles attached to the top of the bag which easily do up around the pushchairs handle. I honestly cannot fault this bag. It is still ideal for when your baby's are small but it also fantastic for toddlers too. It would also make a good overnight back because of the amount of items you can fit in it and could quite possibly be used as a school bag later on. Priced at £89 I do believe it is good value for money due to the length of time you'll be able to use it for. You are also paying for superb quality. A stylish yet practical bag which in my opinion is well worth every penny. Disclaimer : I was sent this bag FOC for reviewing purposes however all thoughts and opinions are my own. I love love love that! The Owl print is awesome.